Thanks to Rob Moore for bringing me beer from an Evanston, Ill., brewery with the ironic name of Temperance Beer Company. Ah, the temperance movement. We laugh at it now, but there was a time when it mattered to the point of the 13-year social nightmare known as Prohibition. The temperance movement was more than ax-swinging Carrie Nation and her followers. It was a long festering political movement that eventually brought about the ill-fated Volstead Act. After its repeal in 1933, the temperance movement disappeared from mainstream politics and lost its sway in most areas of the country, although here in Door County, the temperance movement had a voice well into the 1960s via the local newspaper, which continued to carry Women’s Christian Temperance Union columns as legitimate expressions of public sentiment. If an individual feels the need to be temperate, fine. I know plenty of temperate people, and even they, I believe, would find the temperance movement to be an impossible path unless we all were exactly the same. And we never will be. Legislating a society to be temperate is, uhm, nuts! Temperance as a social policy is an ugly thing. We know that for a fact from our own political history. 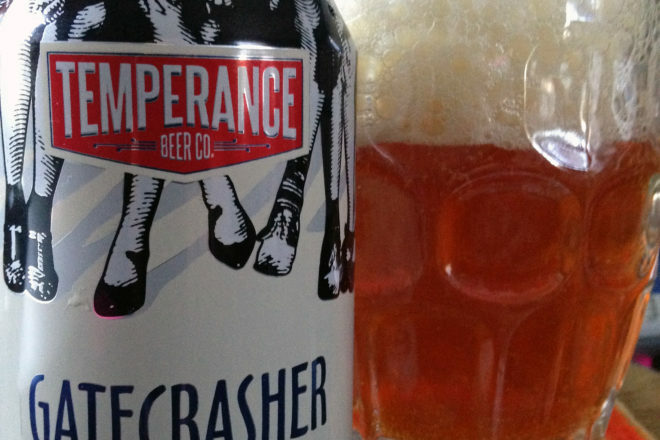 Rob brought me a sixer of Temperance’s Gatecrasher, an English-style IPA. I do enjoy a good English-style IPA. I think Rob must have known that, and this is a good one. I poured it into an authentic English dimpled mug pint (I’ve got a half-pint version as well). What do I mean by a good English-style IPA? In my book that means it’s not an over-the-top-hop-heavy West Coast IPA. Imperial pale ales have never been about hops. The great ones are big but always a beautiful balance between malt and hops. One could even say they are temperate in their use of both. I never said being temperate is bad. Like anything, it’s good in moderation, and I like it here in Gatecrasher IPA. The judges at the Great American Beer Festival also like this beer, having awarded it a silver medal in 2014 and a gold medal last year.